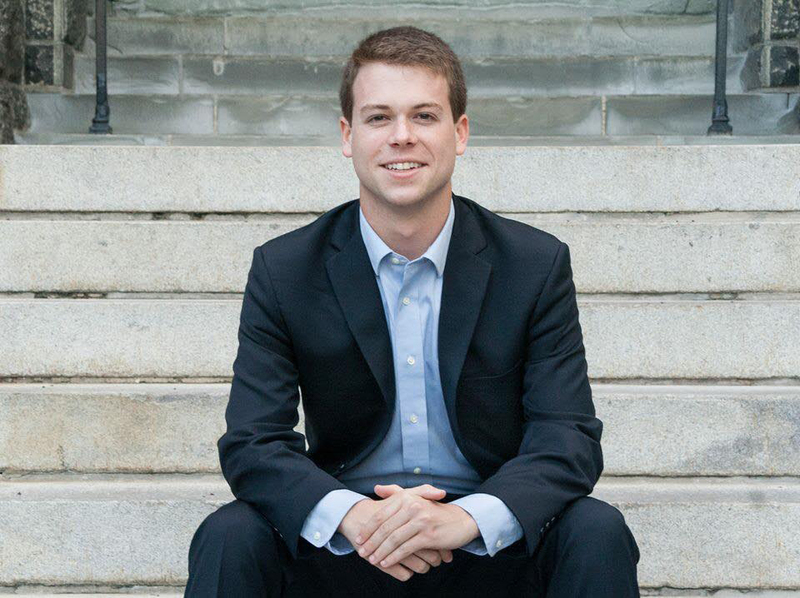 LGBT-U Apprentice Q&A: Sean Buckley in Washington, D.C. In 2015, Freedom for All Americans launched an exciting new program designed to strengthen the movement to win nondiscrimination protections for all LGBT Americans: LGBT University, an ambitious training and development program for the next wave of campaign leaders. The first cohort, comprised of 16 apprentices from all across the country, is nearly halfway through the year-long training, which convened for the first time last fall in Phoenix, Arizona for training sessions and informational overviews about every facet of running public education and advocacy campaigns – from fundraising to field to communications to strategy. 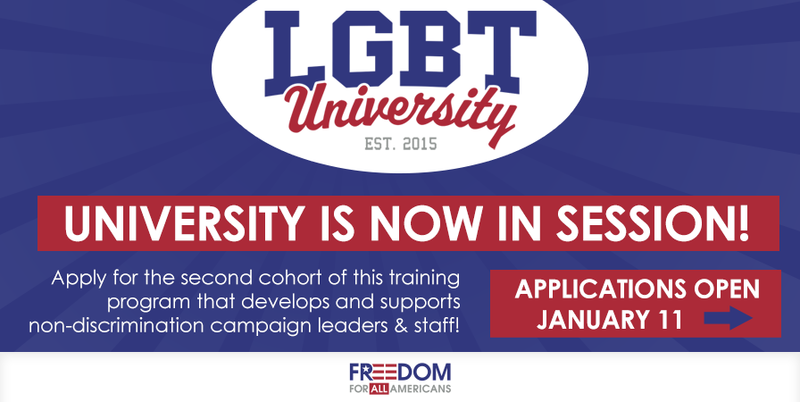 Applications for the second cohort of LGBT University are now open through February 7, 2016. Click here to apply. Sean Buckley, who is studying finance and government at Georgetown University in the class of 2016 in Washington, D.C., is one of the apprentices in the first LGBT University class. In addition to his studies, he has committed time with Young Conservatives for the Freedom to Marry and the Platform Reform campaign, which seek to encourage the Republican party to welcome all people – including LGBT people – into the party and remove anti-LGBT language from the official party platform. We spoke with Sean last month about the personal experiences that have led him to be an advocate, his views on why a majority of conservatives support LGBT-inclusive nondiscrimination legislation, and his time so far with LGBT University. How did your work with Young Conservatives for the Freedom to Marry and the Platform Reform campaign lead you to LGBT University? I started working as a member of the leadership committee of Young Conservatives last year, and through that I realized the power of single-issue organizations, where you can come together with people across the political spectrum. That was a really powerful, formative experience for me. When I heard about Freedom for All Americans and the single-issue nature to the work, I knew it was something I wanted to be a part of. How did you learn that it was important to you to advocate for LGBT issues? I grew up in Rhode Island in a very Catholic, conservative community and I didn’t really know anyone who was gay or transgender. When I first thought that I might be gay, I went into complete denial about it. I prayed extensively over it, and sincerely believed that who I was and what I believed to be wholly incompatible. Then about a year ago, I looked back on those preconceived notions of what it meant to be gay, what it meant to be a Republican – what it meant to be me. That’s probably pretty standard for a young person, and I grew a lot from it, but it was hard. There’s the old adage that says if you don’t like what you see, either change it or leave it – so I reached a point where I saw that I needed to take a step back to see what that meant for me. If I wanted to stay a Republican, I needed to play a role in changing the way the Party treated LGBT people. First, because it’s the right thing to do, but second because Republicans need to figure out a way to communicate to a millennial audience that sees acceptance of LGBT people as a gateway issue. The party needs to improve on these deeply personal issues. Why is it important to you to stand up for LGBT nondiscrimination? I feel really fortunate that I come from a family where, no matter our disagreements, they love me unconditionally. I never feared that being gay would impact my housing or my ability to earn a living. But that’s not the normal experience for most LGBT Americans; a majority of Americans live in states where LGBT people are completely unprotected from discrimination. Nondiscrimination is really about everything we hold dear as Americans: Being able to provide for yourself and your family, being able to achieve the American dream. Like most Americans, my family originally came to this country as immigrants. They risked everything to come here because it was a place where they would be judged based on of their work ethic rather than who they were or what they believed There is hope here that we can make a change to make sure that same dream is available to all Americans. This also isn’t a Republican issue or a Democratic issue or even a bipartisan issue – it’s a nonpartisan issue. The fact that people today are denied the opportunity to provide for themselves and their families based on who they are or who they love is wrong – full stop. I believe our nation is strongest when everyone has the chance to achieve the American dream and LGBT inclusive non-discrimination protections are fully in line with that principle. What are your impressions so far of LGBT University? I was a little intimidated initially during the first session in Phoenix – some of these trainers and session facilitators were amazing leaders who have been working on LGBT issues for years. The amount of resources invested in the apprentices, and the extent to which the material covered was both holistic and comprehensive was all pretty incredible. It was intense and challenging, both emotionally and intellectually – but it was absolutely one of the most rewarding weeks of my life. The trainers didn’t lecture us – we were part of the discussion. We had the ability to engage with phone banking, coalition meetings, and other aspects of an effective campaign. Everything we learned in the classroom was applied right then and there in Phoenix with the Competitive Arizona campaign. I just feel so lucky to be included in this cohort – and I could not be more excited to see what’s next. Learn more about LGBT-U – and apply for the second cohort January 11 through February 7 – here.